It is so hard to find a favorite address that you have saved and would be great if they were in alphabetical order. So I am using Waze mostly for avoiding traffic going to and from work, I suppose like most people. It would be helpful to have a feature where it gives an audible alert if it is plotting a course that is different from the "normal" one to avoid traffic. I imagine this could work by determining the best route assuming no significant traffic, and giving an alert if it is plotting a different course than that. Same thing goes for changes in mid-course due to accidents, jams, etc., that occur after I start. Normal navigation announcements aren't too useful on a regular route like this; would prefer to have announcements when there is something out of the ordinary--even ONLY those announcements. Please support the new Windows 10 Mobile platform. A lot of us have 2 or more phones using Android, IOS, and WP/W10 Mobile. Would love to have the same experiences on all platforms. Add a button in waze for users to indicate a live animal on the side of a road (like a grazing deer). Waze users can be warned of this animal on the side of the road and can slow down when they are close to this place. This would help prevent roadkill. Return the displaying of FB friends on a map in app. Most users are interested in where their friends are, not unknown people. Need to make FB friends be visible on the map all the time, not just when they are within 1 km. There is an invisible button for Confidentiality to compliance in the application. Why do not add a Speed Limiter function (audible and/or visual) to WAZE ?! With a user speed limit preset (eg: city, extra-urban, expressway, motorway) or 1 single on the fly. It would then be possible to drive to the limit of what says the law, which is often different from panels display in most countries, without risking tickets whatever the country. I suggest that audible alerts can be limited in time by a timer. For visual alerts, the outline of the card (a frame) flash of color to the user's choice, or a biggest flashing Speedometer ! Use the speedometer icone displayed on map to activate and preset the speed limits. To select a speed limit while driving, if you click on the Speedometer moving, the current speed will be selected as your Speed Limit. This would allow Waze to take much ahead of competition ! Allow useres an option for choosing that they are HOV lane compliant. This way you waze can give traffic feedback for us in the HOV lane. Add dash cam features in background, auto record when car is moving, just enable feature and everything runs in background. Similar to app called witness. Record 10 segments, 6min each. Store date,time and GPS. Thought of this after learning that every car in Russia has a dash cam (all those meteor recordings). Please add a feature to report a traffic light outage. A traffic light that's out is a major problem in a commute. Train crossings and train stoppage. Okay, I thought your app had everything until today. I ran into a slow train crossing. This is a difficult one because trains are there and then not there. I would like the ability to report trains and maybe speed/length in general terms. Then there are the trains that just stop on the crossing for an extended amount of time. Those would be very helpful to report. But, at least being able to report the train is crossing and direction of movement will help people I think. LARGER FONT!!! not all are 25 yo... at 50+ I can't see 90% of the writing on the maps!! adjust to visually challenged!! (aka over 50 yo..) at least offer an option! Could you either add rest stops, or allow us to report rest stops, as well as distance to the next one as reported/displayed? for those who are not foolishly paying to send text communcations please add option to hide such from the UI. Optionally replace with Jabber (XMPP). There is no sane reason to use OLD sms on a smartphone! Stop burning money. You should add support for On Board Diagnostics OBD II from elm327 bluetooth as Torque app does and the stats to Waze user profile. Bring Elvis voice back please! I am not an Elvis fan at heart. However I LOVE the Elvis voice. Where did he go and can you bring him back please? Ever since last year, the Old Waze Monster is being replaced by the New Waze Monster. 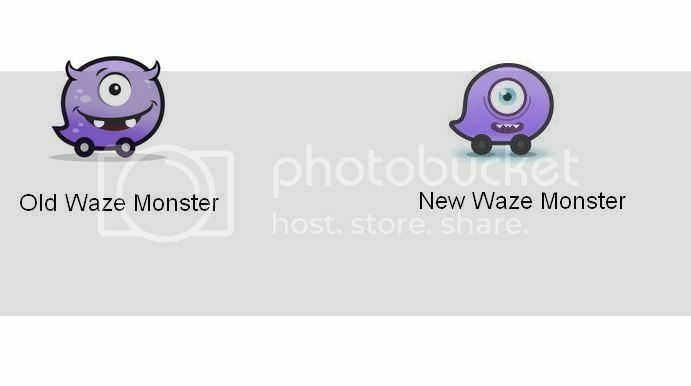 Please compare and vote for the Best Looking Waze Monster. Waze is awesome and everyone is using it. Some like me to navigate from Northern Denmark all the way to Romania on holiday others just to find out about speed traps. But then due to the point system, the new users instead of thanking for a reported police trap they keep re-posting the same thing a lot. This leads to 10-20 police reports for only one police speed trap. In a village which was 1km long I've seen 13 police reports for the same police car. I generally look from time to time on the map, and even if it is a police marked on the other side I pay attention to the speed limit. It would be nice to have a limit of reports per a certain distance. I've used other police trap apps and they were limiting the distance between the reports. This way you could only report another police trap if it as more than 1 km away from an already existing one. This is also happening for traffic reports where on a stretch of 1km road you get 20-30 heavy/standstill traffic. This will only load the server and client uselessly and also consume more data on the end user and server. SUGGESTION: Limit the number of POLICE (visible or invisible)/WEATHER/TRAFFIC/CAR STOPPED ON SHOLDER/ROAD WORKS reports to maximum 1 per 1km in both directions. If a user tries to post a new similar/identical report, use his report as a THANK YOU for the existing report and warn the user to use the thank you (thumbs up) button next time. The pothole report should be left as it is, as you might have potholes 800m apart. I would like a way to ignore certain alerts. I pass three redlight cameras during my commute, each way, every day. I learned my speeding lesson long ago and I stop at red lights. This warning is annoying. We should have a way to ignore warnings for certain things like redlight cameras or cars on shoulder or whatever.